Bayern v Nürnberg was the expected beating for der Glubb as Bayern München dominated Nürnberg and had the match more or less wrapped up after 57 minutes. Nürnberg continue to struggle against the big boys. It took Bayern just nine minutes to find the opening goal. 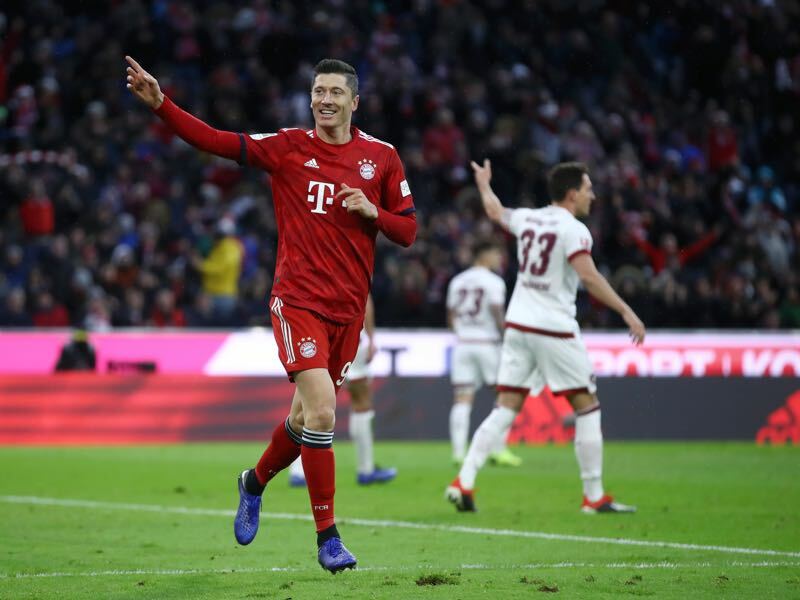 Joshua Kimmich brought in a corner, and Robert Lewandowski rose the highest inside the six-yard box to beat Fabian Bredlow with a header. Bayern were relentless during the opening stage and in the first 16 minutes had 86% ball possession. Bayern’s dominance, however, was not converted into goals. The Bavarians had chances though. In the 24′ minute Lewandowski should have doubled the lead but his shot from inside the box curled over the net. Not that Lewandowski had to wait long for his second. Because in the 28′ minute Leon Goretzka unleashed a shot from outside the box that Bredlow tipped to the crossbar, but the Polish striker was waiting for the rebound and tapped the ball across the line to make it 2-0. Bredlow remained the busiest player on the pitch as Bayern kept testing the Nürnberg keeper. Thirty-four minutes in, Bayern had 8-2 shots on goal, dominated passing 343-82, completing 92% of their passes at that stage. Lewandowski, in particular, was fantastic in the first half and should have had a third in the 40′ minute but his volley from the edge of the box just whizzed past the outside post of Bredlow’s goal. In the 46′ minute, it was Joshua Kimmich to test Bredlow. But the Nürnberg keeper was quickly off his feet to tip Kimmich’s low drive from inside the box around the post. Not that Bayern fans had to wait much longer for the next goal. In the 57′ minute, Bredlow played a poor ball out of the back that ended up with Serge Gnabry, the Bayern forward went one-v-one with the keeper, who actually managed to keep out the shot, but the rebound landed at Frank Ribéry’s feet, and the Frenchman easily scored to make it 3-0. That goal settled it for Bayern and with the midweek fixture against Ajax in mind took off the foot of the pedal. Niko Kovac used Bayern’s dominance to give some playing time to the likes of Sandro Wagner, Kingsley Coman and Thiago. And Nürnberg? 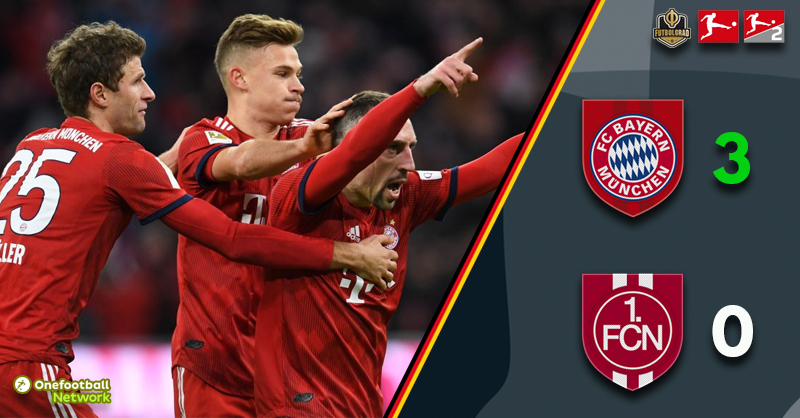 The Franconians had nothing to offer in the second half and with Bayern content with the three goals the match trickled down towards the final whistle. Robert Lewandowski was the man of the match. The Polish striker scored two goals and was fantastic in the first half. But it was not just the goals that showed Lewandowski’s dominance throughout the 90 minutes. The striker managed to complete 89.3% of his 25 passes and was a constant threat for Nürnberg’s backline. Are Bayern back on track or were Nürnberg simply no measurement? The answer is a bit of both. Bayern have now won three games in a row and finally managed a clean sheet. Furthermore, Niko Kovac’s men were dominant throughout the 90 minutes and never gave the Franconians any room to breath. On the other hand, Nürnberg have struggled all season against the big boys of the Bundesliga and among others were defeated 7-0 by Dortmund, 6-0 by Leipzig and 5-2 by Schalke. Hence, a heavy defeat for der Glubb was always going to be in the cards, and Bayern now need to confirm this performance midweek against Ajax in Amsterdam. Frank Ribéry has now scored in 12 consecutive seasons. Robert Lewandowski scores his 42nd brace in the Bundesliga only Gerd Müller has scored more (55). Bayern have not lost to Nürnberg in 15 home games and of those have won the last seven and have not conceded in the last five.